After a great opening to her series in Sea Witch, Kantra returns with writing that is top-notch here – hence earning the 3 bat rank. I wish I would have liked this more because her world is exciting to delve into, but the characters just didn’t shine like the ones in Sea Witch. I found the hero and heroine annoying and there were a few portions of the book where I wanted the demon to shred them both – particularly the heroine. 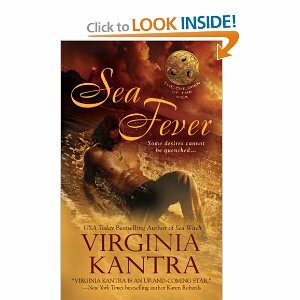 In Sea Witch, Kantra did a stellar job solidly linking the cause and effect of the characters’ actions, decisions and emotions – in Sea Fever, that’s lacking and it slips into a few wtf moments of melodrama, out of left-field decisions and some straight out ‘duh’ moments. That said, again, her writing and style is stellar and her general presentation is solid. It makes for a decent and fun read for fans of paranormal romance. I still plan on reading the third installment in her series, Sea Lord, in hopes that the cast is more relatable because I do enjoy her style and her world.